By J Hutcherson (Nov 30, 2017) US Soccer Players - MLS has moved from a dozen to four expansion candidates with two spots available. The league confirmed on Wednesday that they'd pick those two expansion teams probably by the end of the year. It's the conclusion of a compacted process that started with ten cities and added two more. MLS is a known entity across the country at this point. They don't have to shop cities for expansion teams. The cities come to them. That's the scenario about to reach its conclusion. The cities bid, revised, tried to get public funding, and moved up and down the expansion table accordingly. As plenty have already pointed out, the stadium piece ended up being crucial. Draw a line between the cities with real stadium plans with public support and those without it. That made MLS's decision on their final four cities easy. What comes next might not be as straightforward. 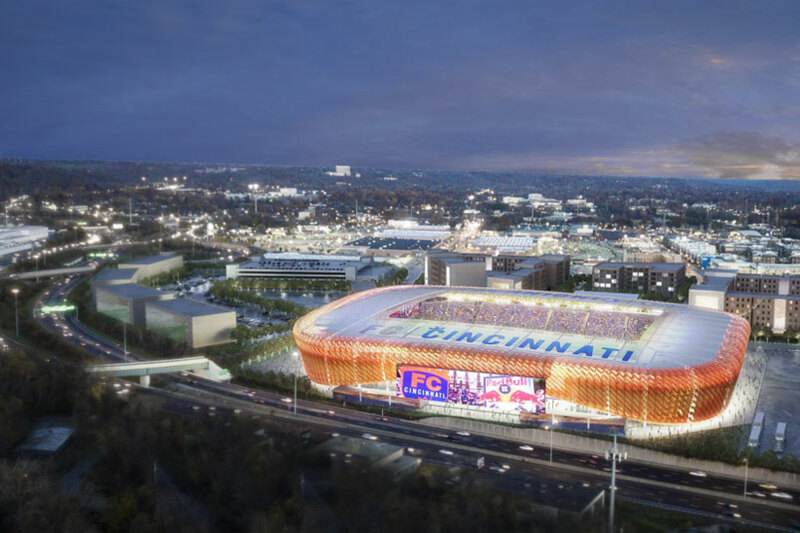 Cincinnati and Sacramento have the local support for people willing to pay to watch professional soccer in place. Nashville and Detroit don't, but market size has to be part of the scenario. MLS doesn't talk about their footprint anymore, but it's certainly still in play. Doubling down in northern California is different from extending the footprint to Tennessee. Nashville helps build out a part of the country with wide gaps between MLS clubs. The two North Carolina bids falling down the table denied MLS the chance to make an obvious link between DC and Atlanta, building out the East Coast in a way that would've seemed like an overreach just a few years ago. That doubling up issue also applies in theory to Ohio. The Columbus scenario has three potential outcomes. The team stays, the team moves to Austin without a replacement, or the team moves and MLS puts an expansion team in Columbus. Two of those means having MLS teams in Ohio a little over a hundred miles apart. Only the National Football League does that, and they've got 32 teams. Columbus potentially moving to Austin was already an issue for San Antonio's expansion bid. San Antonio didn't make the final four. With Austin 80 miles away, the doubling up issue has to be a concern. No major league has made that move. MLS allowing a club to move in the expansion era complicates things. For a league trying to sell the club ideal, it's a tough message. These are franchises in a North American pro sports market where teams move. That's opposed to the soccer ideal of clubs that might not be competitive but wouldn't consider moving to a different city. MLS throwing that into harsh reality is a choice, one that is now directly connected to the next round of expansion. It's not the only choice the league will make. They're choosing between one major metro and three emerging markets with Detroit in the mix. Detroit is the only expansion candidate left with teams in all four major leagues. Their attempt to revitalize their downtown core has centered around new stadiums for those teams. MLS can become part of that narrative of revival. Like the other expansion candidates, Detroit is making it easy. The stadium deal and the necessary support is there. What all four bids share is that turnkey approach to expansion. MLS doesn't have to do anything but accept the fee. There's no need for a campaign season to get what the league wants. While this might have seemed startling at various times in the league's history, it's their new normal. It also opens up the league to criticism. Cashing expansion checks is an old meme in American pro soccer. The original NASL was happy to accept new teams while shifting existing teams all over the map. Their biggest competitor was the MISL who did their own addition and relocation during their prime years. Keeping the same teams in place season-to-season became a challenge that American soccer leagues still struggle with. MLS is supposed to be the exception. So far, MLS has shut down three clubs while moving and replacing another. That's the downside of the MLS model, but each example makes a specific case for why the move made sense at the time. The league had reasons for each of them. It's the same with the struggling teams they kept in place. The Wizards turning into Sporting Kansas City is the big success story, but Colorado and Dallas keeping up also make the league's point. They've resisted the wholesale relocations that tend to happen early on in a league's existence. They've also not had an expansion failure since Chivas USA. There's pressure each time any league expands. It's a calculated risk in return for that fee. The new team may not work. We've seen that happen in enough leagues that expansion turned into a rarity coming out of the 1990s. It's that risk that when expansion goes wrong, it calls so much about a league into question. For MLS right now, the reward is picking from four markets that have everything they want already in place. It's not just the stadiums. It's that turnkey approach where MLS has good reason to believe that they won't be adding an eventual problem. For the business of expansion in North American pro sports, that's the win. Club World Cup or Confederations Cup?